By now I’m sure you are all well into your Easter preparations! My fridge is bulging with Easter Dinner ingredients, and the guest list is closing in on forty. I know that sounds like a bunch, and it is, but more than half of that is made up of our children and grandchildren. Everyone will be bringing contributions to the BIG feast! I wanted to show you this little centerpiece that I put together last week for a luncheon, and then I used it the following day for a church ladies’ brunch, and later that day for Sabbath dinner. The whole thing came from Rachel’s storehouse of ideas. 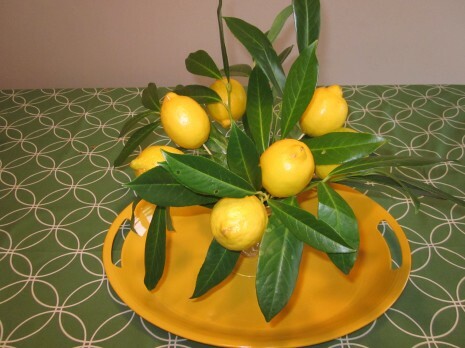 She cut me the laurel leaves from some of her bushes, and told me to stick some lemons on skewers and pop the whole thing in a vase. It took all of a minute to put together, and it’s now almost a week old and still going strong. So if you’re looking for a quick, pretty idea for your table, here it is, courtesy of Lizzie. It looked fantastic in person too! Wow! What a great idea…lovely, quick – thank you! Y’all should see this photo, too. Yes, Valerie linked to the pic my friend Trish took at the ladies’ Easter brunch on Saturday. Each table had a hostess who brought the dishes, and then three ladies at each table volunteered to bring food: an egg dish, cinnamon rolls, and fruit. The Ladies’ Fellowship provided the coffee and orange juice (and the tablecloths and napkins). It was lots of fun! This is making me think I could get quite an industry going by clipping the branches off the lemon tree in my front yard and shipping them to Moscow in the spring! That’s very funny, Brittany! Your centerpiece is beautiful, Mrs. Wilson!